As we are seeing a trend from the old, “work-life balance”, towards the new, “work-life integration”, millennial employees are entering the workplace expecting to feel not only excited and passionate, but also fully engaged in what the whole team is building. Keeping the team engaged is the secret sauce to creating company culture that ultimately turns ‘team’ into ‘family.’ Here are a few tips to move your organization towards total engagement. We used think of employee growth opportunities as marketing classes, design workshops, or industry conferences. This is no longer the case. Sometimes the best and most rewarding employee growth opportunities might appear at first to have little to do with your company’s function or purpose. In fact, the more you allow employees to explore other interests, the more they will stretch and open up to the possibility of new skills. This may include supporting your team on activities like training for a marathon, personal growth courses like the Landmark Forum, meditation classes, and self exploration festivals like Burning Man. Guaranteed they will return with a better sense of self, which will be quickly applied to their work and the positive energy from their experience will permeate throughout the team. How much of your personal life you share with your team is up to you and specific to every organization. You are never required to divulge details of your personal life if that doesn’t work for your team and your company culture. However, all teams can find one minute in their day to share something – something that inspired them or that they simply found interesting. This can be an article, a photo, a link to something interesting about a partner or a client. We’re all human, we all have a life outside of the office, and it’s important to set that tone among colleagues, and bond over interesting news articles, beautiful photos of travel destinations and hilarious viral videos. Continuing with our generation’s trend towards the social, many of us are finding that our friends and we are sharing more content that has to do with our careers and jobs. It’s exciting to tell the world about a new project, or a business trip, or a speaker you saw at a recent conference. Because millennials value finding passion in the workplace, we are constantly expressing this passion through our social channels because it’s one of the things we take the most pride in (rather than the amount of our winter bonuses or the size of our offices). By tagging your co-workers in these prideful posts about your team’s accomplishments, you can create a real sense of team pride even when you aren’t “at work”. In our company culture, when we come across something we think is a great idea or relates to our work, we’ll tag the whole team by company name and individual names on facebook, twitter, and instagram. Yes, it’s true that each team member was hired to perform a specific function and that this expertise contributes to the success of a team. But have you ever asked your colleagues what else they might like to try handling at work, even in a small way? Maybe the head of biz dev has always wanted to show off her graphic design skills, or perhaps your COO is also a great writer. Figure out a way to find out these things and find opportunities to let people flex some different muscles. Who knows, you could discover some seriously amazing hidden talents on your team, and give team members a small break from their everyday job functions. Sometimes, you have to think outside the box in order to keep the team engaged and activated at all times. This might mean skill building outside the workplace, interaction on social media, and even ‘role playing’ as it relates to your industry. The more you can be creative, the more it will tie back into the core work, where it matters most. 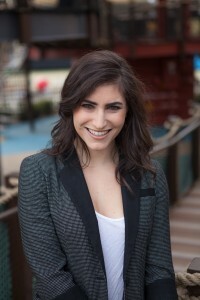 Danielle Robin is the Director of Content Strategy for CatalystCreativ. Listed on this year’s Forbes 30 Under 30 for Advertising and Marketing, CatalystCreativ is an experience studio that’s focused on helping cities, brands and institutions flourish by developing educational and inspirational experiences through strategy as well as on and offline campaigns to engage Millennials. CatalystCreativ is funded by Zappos CEO and venture capitalist Tony Hsieh as part of the Downtown Project. Robin and CatalystCreativ have worked with brands such as NPR, Dell, Ekocycle and Starwood Hotels.